The lecture given by Professor Britte on immunology with a focus on Lupus was interesting yet extremely technical so I will do my best to recapitulate what she discussed. I also could not stay for the full presentation as I had to be at work at 2:45. She started out by defining an antigen as any substance that elicits an immune system function. Sometimes these antigens that elicit immune system responses are allergic reactions from foreign yet harmless particles such as pollen. Other autoimmune diseases do not recognize cells of the own body and kill them. Antibodies are produced by the immune system to neutralize these antigens and bind together into a pair or clumps of matter in the lymph nodes. Lupus is a serious autoimmune disease that can cause significant damage to kidneys, heart, lungs, or blood cells as the immune cells attack their own tissues as if they were harmful antigens. 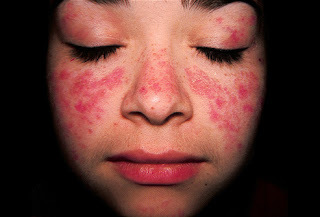 People with lupus can have symptoms such as fatigue, joint pain or swelling, fever, skin rash, mouth sores, and migraine headaches. It effects primarily women (about 90%) and effects African Americans more than Caucasian and Asian populations. There may be some relation with Lupus and various estrogen levels because it is more prevalent in women ages 15-45, from puberty until right before menopause. Transgenic mice were used for experimentation because they had conditions in which their body accumulated large amounts of antigen/antibody matter that was not being removed normally by phagocytic action. Genetic alteration was made on these mice to test whether a change in DNA would be helpful in preventing or treating Lupus.